Yet after his election as councillor in 2017 and with this in the public domain, McDonnell continued to support Milani and push him for higher office. 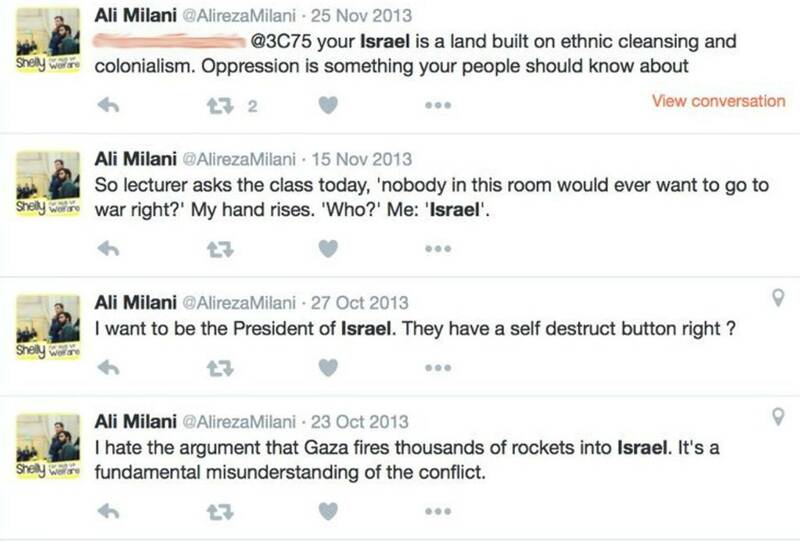 Indeed, when I challenged Milani about these postings on Twitter, he blocked me and subsequently claimed that I am an ‘Islamophobe’ for asking such questions. 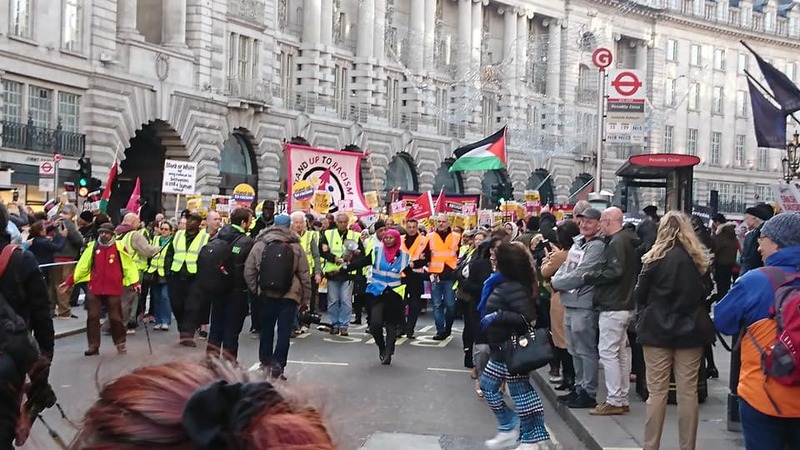 Jenny Manson is Vice-Chair of the Corbyn supporting Jewish Voice for Labour (JVL), a Momentum backed group that actually counter protested against Jews and Labour MP’s calling out Antisemitism on Parliament Square last year where I was in attendance. On the night, some people with Jewish sounding names who had tickets were rejected on the door. Indeed, journalist Etan Smallman, a resident in the constituency and contributor to papers such as The Guardian and The Telegraph, was man handled out of the event by security. Reporters from The Jewish Chronicle and Jewish News were also emailed to tell them their tickets had been cancelled as they didn’t have ‘accreditation’. One journalist who I know that did get in told me that it was also made clear at the start of the event that any questions on Israel, Palestine or Antisemitism would not be answered and anyone posing them would be summarily ejected from the building. The final question of the night was indeed on that subject and the person posing the question was dealt with as they suggested. With the national rise in racially aggravated incidents on the Jewish population in an area where many of the community live, surely taking and answering a question on the matter should be expected and indeed be a major issue for those residents? Not for the first time, a public meeting with McDonnell has been made artificially sterile to protect him from unwelcome scrutiny. 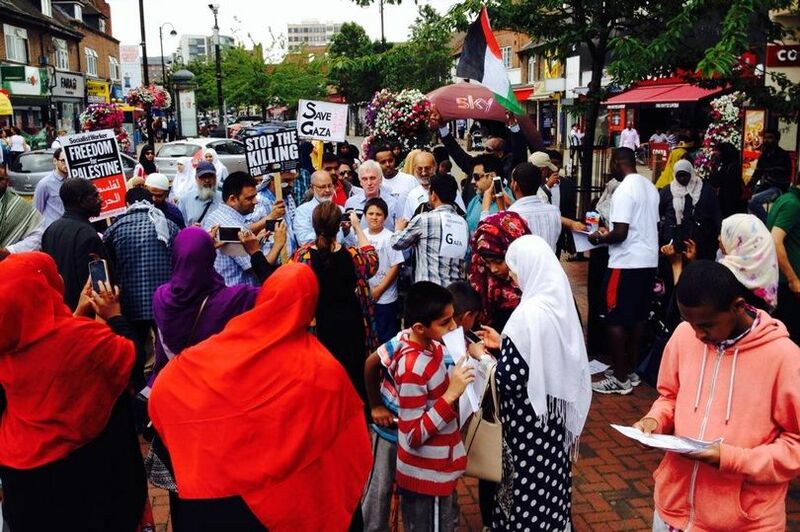 On 2nd August 2014, McDonnell fronted a street demonstration in my local town under the title #Hayes4Gaza. This campaign mirrored the BDS movement in calling for a boycott of goods imported from Israel. Interpal are a proscribed organisation in many countries including Australia, Canada and the USA for their links to extreme Islamist organisations. There is also evidence from multiple sources that Interpal have links to the Terrorist Group Hamas and they have attracted condemnation from the Charities Commission about these links. As you can see from the piece, McDonnell also supported an Early Day Motion in The House alongside Labour leader Jeremy Corbyn (EDM786) which called on the government to put pressure on the US to take them off the proscribed list. With Hamas’ stated aim of eradicating both the Jewish state and all Jews from The Middle East, how does this square with McDonnell’s LBC interview that he opposes all forms of Antisemitism? Whilst McDonnell was running the Hayes4Gaza campaign, he posted links on his website to that of another called ‘Innovative Minds’. Those of us who regularly counter demonstrate against the annual Al Quds parade in London are well aware of InMinds who are well represented at this annual antisemitic hatefest that masquerades as support for the people of Gaza and is sponsored by the Iranian Government via their proxy, the IHRC. McDonnell’s office, no doubt mindful of the negative publicity, removed the links when contacted by The Standard, just as they removed the pieces asking for donations to Interpal when I shone a light on them when he became Shadow Chancellor. McDonnell campaigned long and hard for the release of Shaker Aamer from the Guantanamo Bay detention centre alongside the CAGE organisation. CAGE Director, Asim Qureshi, referred to Jihadi John as ‘a beautiful young man’ and the group have campaigned on student campuses to oppose the government’s Prevent anti terror strategy. During that campaign, McDonnell became friendly with extremist hate preacher Suliman Gani, even recording a video with him for IQRA TV. Gani has well documented and abhorrent views on women’s equality, homosexuality and Ahmaddiya Muslims. McDonnell has frequently referred to my colleagues in UKIP as ‘an evil force in society’ yet is happy to associate with people whose repugnant views are at odds with the values of equality that Labour claim to support. Indeed, when we did have an incidence of antisemitism in the party (The then London Chairman used unacceptable language towards a Jewish member) he was suspended immediately and expelled from the party 2 days later, a move that drew acclaim from The Jewish Chronicle. Contrast that with the re-admission of known Antisemites in to the Labour ranks and the pathetic way that Ken Livingstone was dealt with whilst McDonnell held high office in the party. Actions speak louder than words and in this case it is my opinion that McDonnell’s actions say far more than his protestations on a radio show. I would be delighted to be proven wrong, however – so, if you are reading this John, how about joining myself and the Jewish organisations who will be opposing the Al Quds parade in London this year on Sunday 9th June? 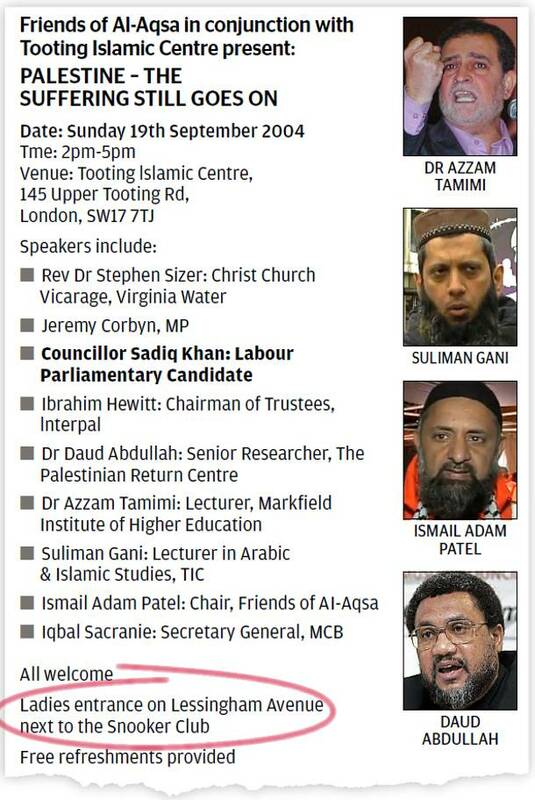 Perhaps you could persuade Comrade Corbyn to attend too – after all, he was there in 2012 on the platform but on the other side with the Islamists, maybe this time he could stand with us to oppose the rise in Antisemitism that the regressive left has been either unable or unwilling to stem? The ball is in your court – match the rhetoric with solid action and prove to us that you stand shoulder to shoulder with England’s Jews and those of us who support them. This entry was posted in Anti Semitism, Islamist extremism, The Labour Party and tagged #Hayes4Gaza, antiSemitism, Israel Advocacy Movement, Jennie Formby, Jenny Manson, John McDonnell, JVL, Labour, Suliman Gani.